It has been quite a week for Southampton Football Club. Not only did they finish it in third place in the Premier League but a trio of their attacking stars found themselves selected in the England squad. For many outsiders, the Saints remarkable rise has come as just as much of a surprise as the call up for Jay Rodriguez, an event unpredicted even by the majority of Saints fans. To those within and around the club, however, the ascent to the top quarter of the Premier League has come as no great shock, though perhaps it has occurred a season or so earlier than most might have imagined. Southampton’s current form should not be considered a flash in the pan. Theirs has been a rapid yet measured and continual rise from the depths of League One, augmented last year by the appointment of a truly gifted manager in Mauricio Pochettino. Yet, despite back-to-back promotions from League One and the Championship, and an impressive first season back in the Premier League, many neutrals are still ignorant of the reasons for Southampton’s resurgence. A question that seems to come up time and again is “But aren’t Southampton bankrupt?” – the simple answer is, “No”. 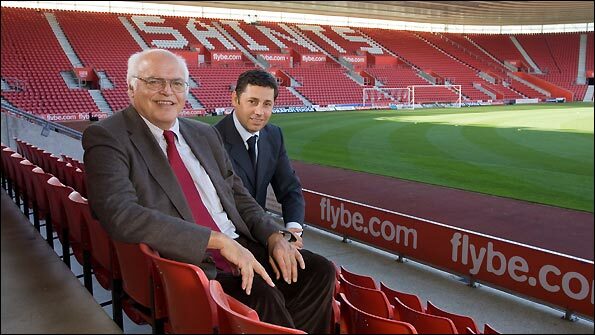 As of July 2009, when the Saints were bought by Swiss businessman Markus Liebherr, the club have been in fantastic financial health, hence their ability to break their transfer record several times with acquisitions including Rodriguez, Victor Wanyama and Dani Osvaldo. However, unlike other nouveau riche clubs, like Queens Park Rangers for example, from day one Liebherr ensured that the club would be managed and would go forward in a sustainable fashion. The primary factor in this was the appointment of the Italian banker Nicola Cortese as Executive Chairman in August 2009. Cortese has won few friends during his time in England, having notable spats with former club hero Matt le Tissier and the local press, whilst his dismissal of popular manager Nigel Adkins was heavily criticised. It is true that Cortese is unsentimental, some might even say ruthless, in his treatment of players and staff. As well as the Adkins incident, Cortese received flak for his handling of Billy Sharp perhaps another. Brought in in January 2012 to spearhead the club’s promotion charge alongside talisman Rickie Lambert, Sharp went on to score 9 goals in 15 games as the Saints returned to the Premiership, only to be promptly told he no longer featured in the club’s plans once this was achieved. Yet, despite his obvious shortcomings, Cortese has been instrumental in Southampton´s continued success. He was quick to implement visions for the club and his ‘five-year plan’ for their return to the Premier League was duly completed ahead of schedule, with a commitment to blooding new players from the youth teams. The pedigree of the Southampton youth academy has never been in doubt, with former players included Mickie Channon, Matt Le Tissier, Alan Shearer, and more recently Gareth Bale, Theo Walcott and Alex Oxlade-Chamberlain. After years of being forced to sell their top prospects due to financial difficulties, the club is now able to reap the rewards of developing their own players without being forced to sell due to financial difficulties. Former academy stars Adam Lallana, now the team’s captain, and the young duo of Luke Shaw and James Ward-Prowse have played key roles in their success this season, rightfully rewarded by England and England U-21 call-ups respectively. With young right-back Calum Chambers captain of England U-19’s, amongst others, verging on breaking into the first-team, the academy’s impressive conveyor belt of young talent doesn’t appear to be slowing down any time soon. Alongside their own prospects, Southampton have also purchased young British talent like Jay Rodriguez and the ever-present Nathaniel Clyne who have bought into the vision the club has going forward. The club has, for the most part, bought well over the last four years; of the current first choice XI, Jose Fonte, Morgan Schneiderlin, Adam Lallana and Rickie Lambert have represented the club in all three leagues. These players have been added to astutely by the elevation of youth team prospects and clever purchases – Artur Boruc, arguably one of the most impressive goalkeepers in the division this season, was signed on a free transfer. Frugality is not the be all and end all for Cortese though and he is more than willing to loosen the purse strings when he feels it will further the clubs interests. Indeed the captures of Dani Osvaldo, Victor Wanyama and the highly impressive Dejan Lovren during the summer should have been indicators that Southampton were aiming high this season. These were not the purchases of a team merely aiming for survival or mid-table obscurity; Osvaldo is an Italian international, Wanyama had a host of big name admirers following his performances against Barcelona the previous season, and Lovren gave up European football with Lyon to join the Saints. Yet this alone does not explain the terrific form of the team this season; for that much credit must go to the manager, Mauricio Pochettino. Whilst Adkin’s sacking in January 2013 was heavily slated, Cortese’s decision has surely been vindicated by the impressive performances under Pochettino. The Argentinian manager chose not to add to the playing squad during that January transfer window, instead deciding to improve the fitness of the players he already had and introduce a new pressing style, methods which led the club to a 14th place finish. This season, he has stayed true to his philosophy, with players pressurising the opposition in their own half, often conceding fouls, but very rarely being punished by the referee. This has been a considerable factor in their remarkable defensive record; only Serie A leaders Roma have conceded less goals so far this season. A solid defence has been complimented by a flair-filled attack, with combinations of Lambert, Rodriguez, Lallana, Osvaldo, Steven Davis and others interchanging positions seamlessly. This has made them near impossible to mark at times, and leads to the creation of plenty of scoring opportunities as demonstrated by their demolition of Hull last weekend. All this bodes well for the future, and whilst staying in third place this season is probably unrealistic, it seems that Pochettino’s pre-season claim that the club were looking towards Europe may have some solid foundations. This entry was posted in Analysis and opinion and tagged billy sharp, jay rodriguez, markus liebherr, Mauricio Pochettino, nicola cortese, nigel adkins, rickie lambert, saints, southampton by The False Nine. Bookmark the permalink.